At Placenta Practice we are proud to be one of the backers of an exciting new research project taking place at the University Hospital Jena in Germany. Actually this research has been underway for almost a whole year now and by this time next year we hope to see some results. There is so much more to the placenta than what we automatically think about. Yes, it contains iron, which gets talked about a lot, but this is not the sole reason why it is so beneficial. The placenta is made up of 17 hormones which you can read about here in this most recent study. Many hundreds of women have had their placenta encapsulated by me here at the Placenta Practice. Judging by the number of future bookings this number will continue to grow. Whilst practically every single one of my clients are amazed by the benefits, there isn’t much scientific evidence to back up these benefits. Scientific research in to placenta encapsulation, at least in the UK, proves to be very challenging – as I found out first hand. Mainly because there are no laboratories willing to undertake tests using a human organ. This was once again proven when I tried to get some capsules tested in conjunction with Environmental Health Office and Public Health UK. Both these government agencies failed in their attempt to find a willing laboratory. For me personally, amongst the many indicators of placenta benefits, apart from all the nice feedback I receive from clients, is the number of repeat clients I get. Having been around a while, I am now encapsulating for the same client for the third or even the fourth time. However one main difference being these clients are ordering far more remedies than they did on their first pregnancies. They are no longer ordering just the capsules. I am doing more and more tinctures (which is amazing by the way! ), essences, creams and balms. As is human nature, first time mummies I believe are sceptical about all the benefits we constantly talk about. Lack of scientific evidence does not help. Once they experience the benefits however it’s a different story! This I believe is the reason for the increased orders by repeat clients. They want to make sure they eek out every little benefit they can from their placentas. They plan ahead for when their capsules run out by ordering Tinctures or Essences. 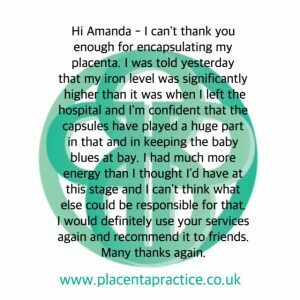 Ultimately Placenta Encapsulation is a personal choice which women make through informing themselves, researching and speaking to other mummies who have had their placentas made into capsules. I am sure science will eventually catch up and prove what women, thousands of them, have been saying for many many years…that the placenta is amazing and every woman should make it her mission to benefit from it.